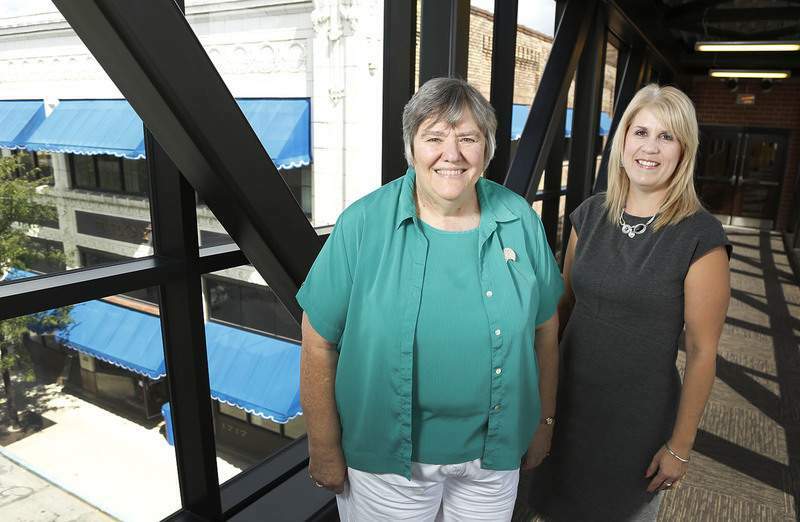 Chad Ryan | The Journal Gazette Mary Haupert, left, is retiring as president and CEO of the Neighborhood Health Clinics on South Calhoun Street. Angie Zaegel, now vice president and COO, will take over the position. In 1969, the Allen County Medical Society created the Three Rivers Neighborhood Health Services to offer well-child services to low-income families. It was renamed the Neighborhood Health Clinics Inc. in 1994. Mary Haupert became president and CEO the following year, and presided over the clinic’s transformation to a federally qualified health center in 1997, the opening of its dental clinic in 1998 and its move in 2000 from the old Lutheran Hospital to its present location at 1717 S. Calhoun St. Under Haupert’s leadership, the clinic has grown in clientele and services. Besides offering primary medical, optometric and dental care, the center partners with hospitals and other health providers to ensure a full range of treatment for its patients. The clinics also help clients navigate the forms and requirements of Obamacare and Indiana’s HIP 2.0 program. In 2014, NHCI opened a satellite office on Paulding Road, and it operates Women, Infants and Children nutrition centers in Albion and Auburn. When Haupert, 67, retires Friday, she will be succeeded by Vice President and Chief Operating Officer Angie Zaegel, 46, who has worked at the clinics since 1997. In an interview last week, Haupert looked back on her 21 years at NHCI’s helm, and Zaegel offered a few thoughts about the health center’s future. Mary, what accomplishment are you proudest of? The number and the kind of folks that we have been able to provide service to. When I started we had about 30 staff, and we were serving somewhere around 4,000 patients. Today, we have about 135 staff and we’re serving about 15,000 medical-dental patients and an additional 12,000 WIC participants. How has the clientele changed since you started? First of all, we’ve had immigrant populations that we didn’t have before. A large influx, first, of Hispanic patients. And then an influx of Burmese patients. And then an influx of African patients. And most recently an influx of Middle Eastern patients. Correct. We’ve always had bilingual staff. We’ve always had some resources to deal with language barriers. But we’ve just had to keep expanding. We get closer and closer but the need gets bigger and bigger, too. The other change with the population: More and more of our patient population are able to get some kind of health-insurance benefits -- not all, but a bigger percentage. When we first started, we had nearly 100 percent uninsured folks and we are running somewhere about 50 percent right now, because of the expansions of health care. There are not. It’s been designated as a medically underserved area. It’s pretty much south-central and southeast – it’s also been designated as a primary-care health professional shortage area, and a dental health professional shortage area, which means the number of dentists per population and the number of physicians per population. If you look at the map, there is hardly any urgent care, there are hardly any private doctors’ offices, dentists’ offices, there are no MRI places, there’s no hospital, there’s no surgery centers. Are you struggling to keep enough people to staff the clinic? Yes but not for that reason. At the same time, people have gotten insurance, and some of those other systems have been very willing to now take some of the patients that we would have seen before. As insurance has been available, some of our patients whose big issue was financial would not need us anymore and they’re willing to drive to Lutheran or Parkview, or (Parkview) Randallia or wherever, and those places have really beefed up their primary-care doctors, their family practice, OB and internal medicine doctors, and they’ve also begun being willing to take Medicaid patients, which they weren’t for a long time willing to do. And so ... people are going to those locations. But it still leaves a hole here for those people who have other issues. Our mission is to serve people who have barriers – who have some reason why it’s not easy for them to take advantage of other providers. We’re not here to be in competition with the providers for the standard patient – we’re here to serve patients who have a barrier. Now, one of the barriers is location – they live in the southeast, and it takes longer to get to, and to get care. Another barrier is that if you look at most providers in the community, you don’t see very many who are Hispanic, you don’t see very many who are African-American, you don’t see very many Burmese, and their staff is not of those groups, either. They walk into a doctor’s office, they see people like us, who may very much want to serve them but who don’t understand the culture, who don’t understand the barriers. Mary, you were an early supporter of the Affordable Care Act. How do you think that has worked? Anytime you change law, anytime you change situations, there are winners and losers. The winners have been people who had pre-existing conditions, who could get no kind of health care before. The winners are our patients, when Indiana went with the Affordable Care Act Medicaid expansion and did a waiver to do their own plan that allows the people who are really low income to get it. People who have long-term medical issues and change jobs don’t have to worry now about whether or not the place has insurance because they can always buy into through the ACA. Those people have won. The people who have lost are the people who are healthy and have a decent income not able to get any of these subsidized programs. They used to be able to buy insurance plans that were carved out for just them. A man of 25 years didn’t have to buy insurance that covered maternity. And he could buy something that didn’t cover preventative kinds of things. Now all of those things are required as part of the program. That person who was healthy and wanted to get something that was cheaper has lost out on that opportunity because they have to buy a full plan, and it costs more. Overall, I think it has really, really helped most people, but there are some people who did lose out because they have to pay more. HIP 2.0 has been a real blessing for Indiana. There are a few glitches in it, but they’re minor. It really has been implemented well. The only real gripe I would have against the state of Indiana is that they have not done a really good job of advertising it or helping with the enrollment in it. Private agencies have had to do that. In Fort Wayne it’s been primarily us and Brightpoint. Are there still people who aren’t getting the health care they need? There are people who don’t know they’re eligible. Especially people who are not what I call chronically poor. Next are people who choose not to have it because they don’t want to pay the premium. They’ll take their chances – until they have a major illness or a major accident or something else, and then they have no coverage. The third group are immigrants. If you’re an undocumented immigrant, you’re not eligible for Affordable Care Act subsidies or for Medicaid, HIP 2.0. If you’re a legal immigrant, you’re not eligible for Medicaid benefits for five years, but you can buy into the Affordable Care Act. Then there are people who have never had insurance before and may get insurance now through one of these programs, and they don’t know how to use insurance. So they don’t get care because they choose a program that has the least premium possible, and then when they need care they don’t have the money to pay the $6,000 deductible or whatever. You don’t turn anybody away? We provide care on a sliding-fee scale to anyone who either is uninsured or their insurance won’t pay for a particular kind of care. It’s not free, but it’s affordable. What kind of health issues do you see the most? The same kinds of chronic diseases that are the most in any population. High blood pressure, diabetes, heart disease, asthma. But we have interesting things. We at times have run into people who came as refugees and we had to figure out some tropical disease. We once had a woman who was a tiny person, and we had to go to the ortho providers in Warsaw and try and get hip joints for replacement for this woman and then we collaborated with IU Medical to operate and put them in. Indiana shows up pretty high on a lot of lists – such as obesity, infant deaths. Do you see the physical evidence of some of those statistics? We’re not necessarily in all areas seeing that our patients are worse off. Because of the treatment you’re providing? Right. If they seek it. People who don’t come or who use the emergency room when they’re really, really sick, then they don’t take care of things as they go. And so then the preventative piece or the early-intervention piece isn’t possible. And that is our goal, to try and offer those things earlier in the process. Is part of your work wellness? So there just aren’t that many opportunities for the wellness pieces. What do you think is the biggest health challenge this community faces? Nobody takes their health seriously until they get sick. We think we should be able to eat as many bad things as we want to because they really taste good. And we party, with alcohol, because that’s what people do. And we use a few drugs here and there but nothing too bad, thinking it won’t get serious. And we don’t exercise like we should. We don’t take it seriously until we have the heart attack or the stroke, and the damage is already done. People who are given a statin drug but never take it. People who don’t take their blood-pressure medicine regularly. People who know they’re diabetic and eat just as many cookies as the next person. Angie, looking forward, what do you want to do? We want to continue to meet the needs of the community. That’s the first priority, and why we’re here. I’ve learned a lot from Mary over the years, and she’s always made decisions using our mission as a guiding force. The needs are still the same, the barriers are still the same. But what they expect from us has changed. Like everybody else, they want their doctors and providers to connect with them electronically. They’re wanting the apps. We’re viewing them as customers and looking at how we can meet what their expectations are, whether it be the hours that we’re open, or how we communicate with them, or how we can monitor their health with our electronic health records. (Federally qualified health centers) have kind of been leaders in some of the cutting-edge initiatives that are out there. There’s always something new on the horizon to implement to improve health in the population that we’re here to serve. Angie, are you expecting that this organization will continue to grow? Yes. We are looking at promoting our services more to our targeted area. We do have some outreach and marketing staff members, but we’re looking at investing more resources in that department. Using social media. We actually have data that shows us our penetration rate in our market we’re supposed to serve. External agencies – our funders ~ look at how well we’re meeting that need. Although they don’t necessarily like to see other health providers come in as competition, if the need is not being met, they will allow somebody else to come in because it’s important that we do take care of people in this medically underserved area. So part of my vision is to make sure that we remain very relevant to our community and that we continue to partner with the various collaborating agencies that we do today. The provider shortage (is the biggest barrier to growing patients). We’ve had difficulty recruiting for positions over the years. It’s not necessarily unique to us. Everybody else that is looking for primary-care doctors in northeast Indiana has difficulties. There’s not a lot of physicians that think of community health centers as their career paths. When we are not able to recruit and retain our physicians and dentists and nurses and nurse practitioners, that’s when we are unable to meet the need of the community. So another key priority for me is going to be making sure that we have in place what we need to recruit and retain providers.